Santorini wines, microbrewery beer on Tinos and the kitron liqueurs of Naxos are among the region’s quality products. 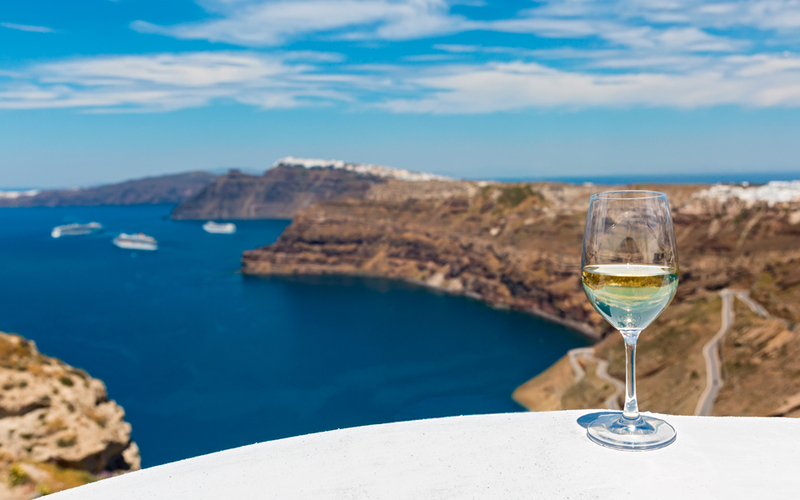 Santorini wines may rank among the world’s best, but plenty more is offered in the region. Exceptional wines, quality beers, PDO liqueurs and rare distilled spirits make up the interesting proposals also coming from the other Cyclades. Once you have booked your ticket for your next destination, make sure to circle out the small wineries, microbreweries, and traditional distilleries on your map – and definitely try their products! 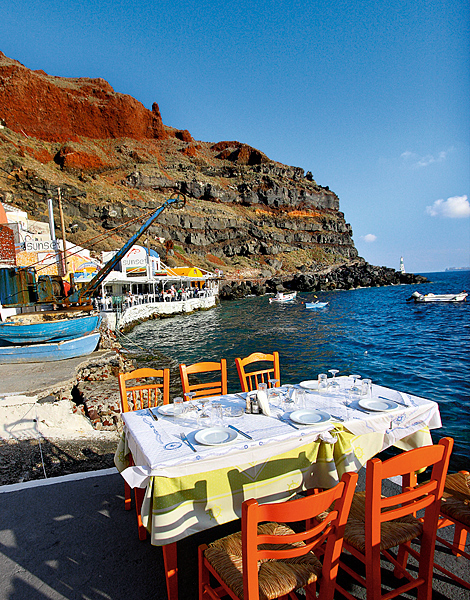 The wine-tasting experience is an institution on Santorini and paying a visit to its wineries is a must. Wine lovers should definitely try the following wines: Argyros winery’s leading Mavrotragano and Santorini wines and Boutari winery’s barrel-fermented Kallisti and full-bodied Selladia. Other must tastes are the Assyrtiko wine and prickly pear-distilled tsipouro at Sigalas winery in Oia; the local Katsano and Gaidouria grape variety wines at Gavalas winery; the premium Assyrtiko de Louros and de Mylos wines at the small Hatzidakis winery and Santo Wines’ superb Nykteri and Vinsanto. At Koutsoyannopoulos winery, explore the Wine Museum with a glass of Vinsanto in hand, while at Canava Roussos winery surrender to the sweet Mavrathiro wine. And at the Artemis Karamolegos winery, where better to enjoy the wines than at its Aroma Avlis restaurant. At the Gaia winery, after having tried its Thalassitis and Santorini – barrel-fermented and, if lucky, from bottles submerged in the sea for a number of years – ask to be guided to the Santorini Brewing Company, which is run by Yiannis Paraskevopoulos, one of Gaia’s co-owners. Visitors here get to see how some of the country’s most extraordinary beers are produced. The range includes the thirst-quenching Yellow Donkey lager, Red Donkey, a red ideal at a meal, and Crazy Donkey, an exciting India pale ale (IPA). The island’s newest winery, named Vassaltis after the volcanic basalt rock that cover part of Santorini’s surface, is owned by Yiannis Valambous. The winery recently produced its exquisite Santorini wine for the second consecutive year and will soon launch several other wines, including a barrel-fermented Santorini. Venetsanos, an older historic winery on the island that was established in 1947, was relaunched roughly two years ago. The facility was the first industrialized winery to operate on Santorini, a state-of-the-art facility in its day. 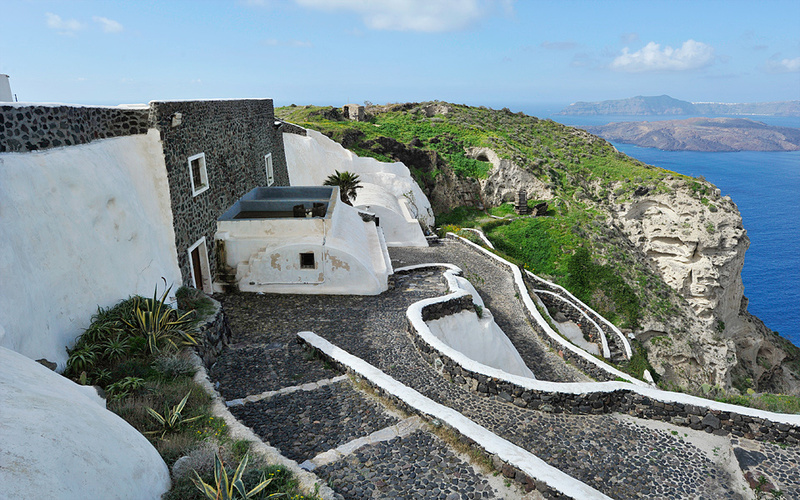 Now attentively restored and offering a breathtaking view, the winery is run by the family of Santorini mayor Anastasios-Nikolaos Zorzos, a nephew of the founder. Enjoy the tour of this winery’s impressive spaces and try the three wines it produces – Santorini, Nyhteri and Mandilaria. Offering marble-crafted art, gastronomy, sensational views and beaches that seem like unexplored gems, Tinos has the potential to win over visitors for life. Alex Kouris, an established figure in Greece’s strategic marketing, tourism and gastronomy domains, and Maya Tsoclis, locally renowned for her travel documentaries and writing, established Cyclades Microbrewery near the island’s capital in 2012. This unit produces the highly regarded Nissos beer in three varieties: a thirst-quenching pilsner, an organic lager, and 7 Beaufort, a stormy special dark pilsner. Two small wineries operate on the island. 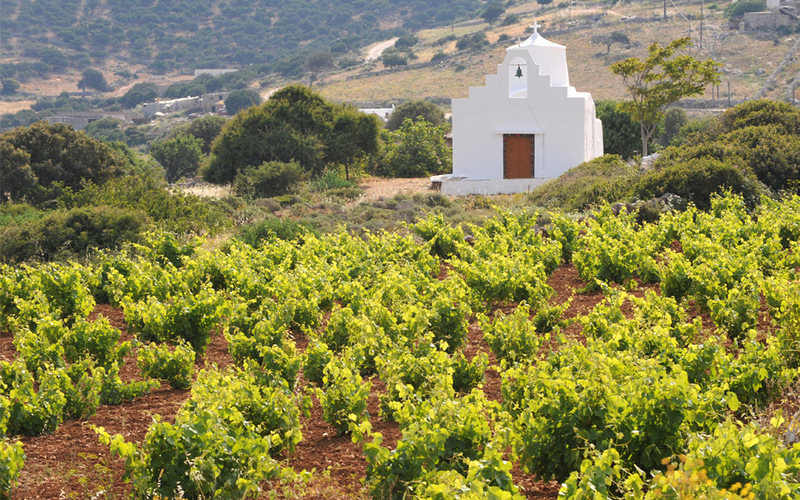 Although both vinify Cycladic grape varieties, their philosophies are entirely different. The older winery of the two, run by Christos Fonsos, remains dedicated to traditional winemaking. At the other end, T-Oinos applies modern precision techniques based on advanced winemaking knowhow for top-quality wines that are exported to the world’s finest restaurants. INFO: Fonsos winery, Komi, Tinos, Tel. (+30) 697.766.8060 • T-Oinos, Falatados, Tinos, Tel. (+30) 22830.411.20 • Cyclades Microbrewery, Vagia, Tinos, Tel. (+30) 22830.263.33. There is plenty to see and do on Syros, the main island of the Cyclades. Cafés and good restaurants in town, sandy and soft beaches, as well as delightful mansions, rebetika spots and a small winery are among the features. 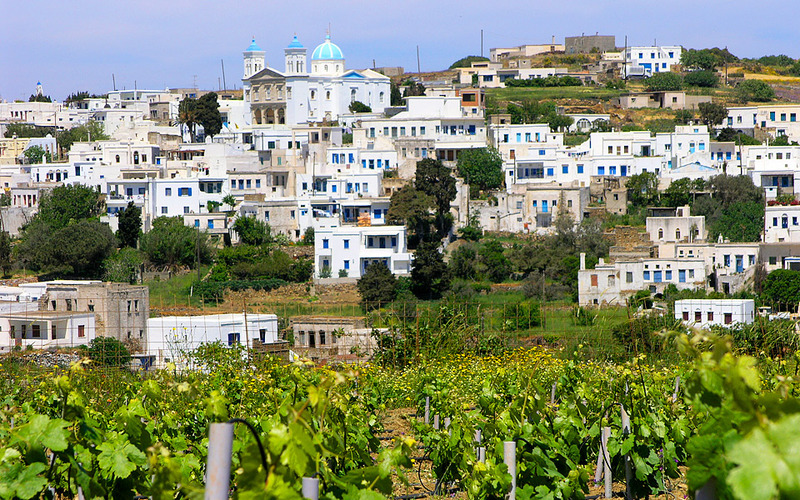 Syros winery is located in Talanta, slightly beyond the main town of Ermoupoli. Enologist Nikos Hatzakis heads this winery’s production of three protected geographical indication (PGI) wines, all made using Cycladic grape varieties – an Assyrtiko labeled San ta Maratha; a refreshing Fabrika, vinified with Monemvasia and Kountoura grapes; as well as a refined Fabrika red, made entirely with Mandilaria grapes. Golden beaches, nightlife and wine are key Paros traits. Three wineries operate on the island, renowned for its souma, a potent grape-based spirit, while a brewery is in the making. It is worth visiting Moraitis winery, the island’s largest and most organized. 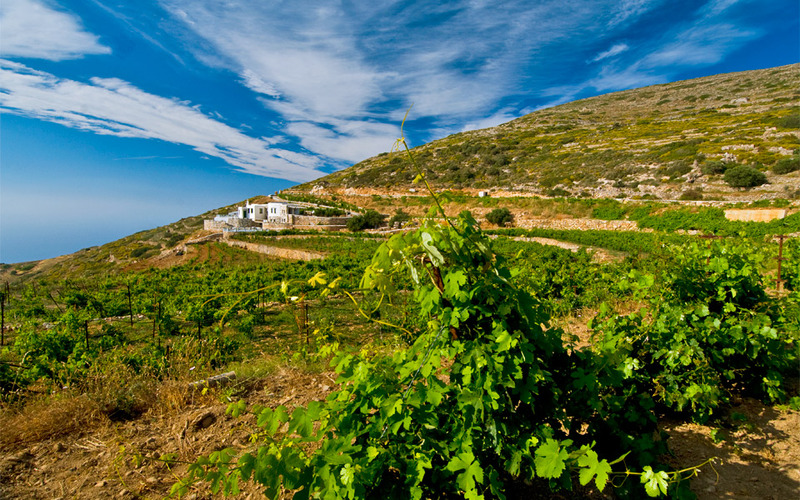 Headed by Giorgos Moraitis, this family-run winery produces wine from organically cultivated vineyards, its jewel offering being the white Monemvasia. The grape variety of this name is used to vinify the island’s PDO reds and whites. 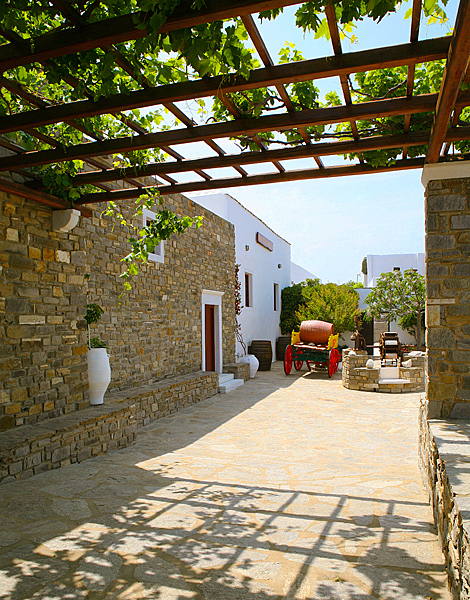 Paros, it should be noted, produces Greece’s only red PDO wine for which white grapes are also used as part of the mix. 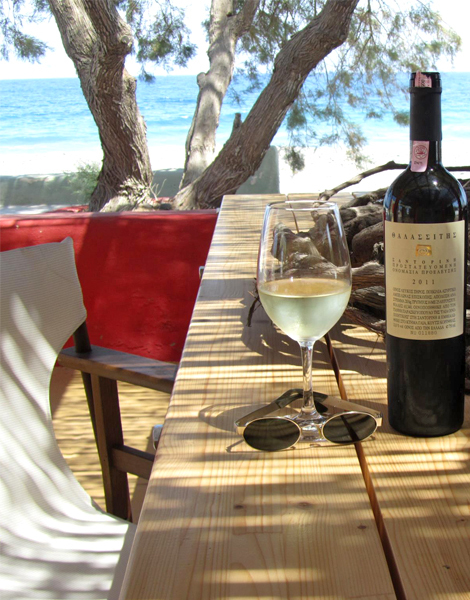 Try the white Paros fermented in oak barrels, as well as the Paros Reserve, made using the Mandilaria and Monemvasia varieties. Don’t neglect to sample the wines from the local EAS cooperative, either. 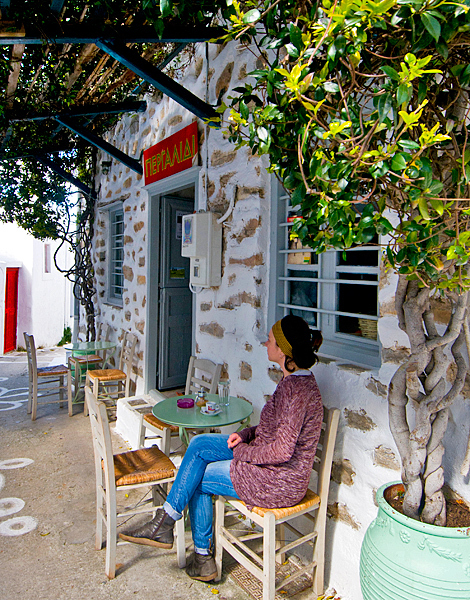 A rich source of natural beauty, Naxos’ extensive history creates a sense of awe and mystery. The omnipresent citrus fruit creates a delightful scent, while the island’s PDO kitron liqueurs, made from the fragrant citron, are absolutely superb. 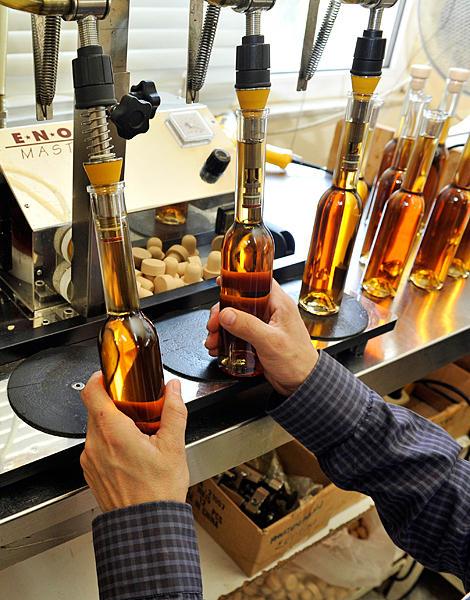 Two distilleries, Vallindras and Probonas, operate on the island, which is the biggest of the Cyclades. Both have distilled citron leaves for decades for a distinctive liqueur that is sure to be embedded in the mind once tried. Visit the distilleries and try the three liqueur varieties produced, or look out for them at restaurants on the island after having enjoyed a quality meal. Local culinary specialties include rooster in red sauce and katsikaki patoudo, goat stuffed with liver and graviera cheese. INFO: Vallindras distillery, Halki, Naxos, Tel. (+30) 22850.312.20 • Probonas distillery, Hora, Naxos, Tel. (+30) 22850.222.58. After having strolled around the alleys and paths and seen the churches and monasteries, visit the island’s small winery run by the Manalis family, which is entirely powered by renewable energy. Three wines are served at the winery’s seasonal restaurant for visitors to try, sided with local assorted meze dishes, at tables set on the veranda. The three wines produced here are: En Thermo, a reddish wine made with Mandilaria and Assyrtiko grapes; En Lefko, a white wine blending Assyrtiko, Aidani and Monemvasia grapes; and Liosato, a sweet wine made with sun-dried grapes. At sunset, locals like to treat visitors psimeni, a raki-and-honey concoction, at the small and charming bars in Hora, the island’s main town. After having tried this fragrant delight, visit the island’s two distilleries to see how it is made. The Amorgion and Amorgaia distilleries are both located in Katapola. 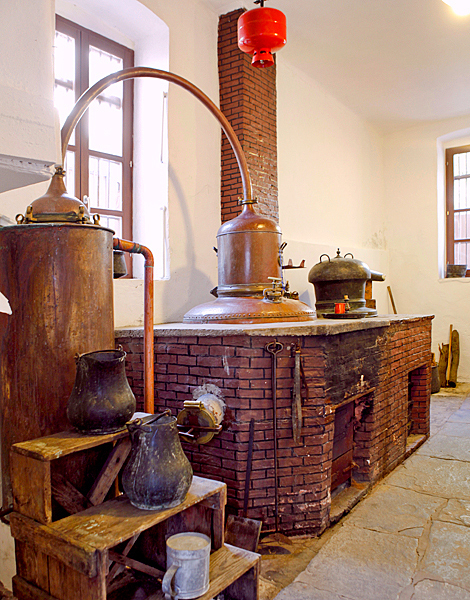 These units also produce a small range of worthwhile liqueurs and distilled spirits. The most discreet of the western Cyclades islands, Serifos is preferred by visitors seeking quiet and relaxed vacations. Young winemaker Christos Chrysoloras, who has cultivated a 2.1-hectare organic vineyard for a number of years, recently established the island’s first winery. The venture’s first wines, a white wine made with the local Serfiotiko grape variety, and a dry rose vinified with Mandilaria grapes, are both PGI. Freshly bottled, they will be marketed under the Xiro Horio (“dry village”) brand name.